It seems an awfully long time ago that I sat down to write about my Dad's passing, in this post: A tribute to our Dad but time marches on at breakneck speed. Last year, we lost our Mum. I don't know why, but it affected me far more than I had expected. I suppose when Dad died I was at the top of my game, in rude health and seemingly indestructible. Time's a funny thing. I'm massively grateful that my brother Gwyn and sister Megan stepped in and made all the arrangements for the funeral - a day that went wonderfully. My sisters Hilary & Christine sorted out the legal stuff. There was no way I could have coped with that. A huge thank you to them both. Gwyn wrote and read out a lovely eulogy at the funeral. I have copied it out below. Mum was born in Cardiff. She was the second child to my Grandparents, Edgar and Mabel Waters. She had one sister Vera. Grandad worked at the docks just around the time of the depression; she often recalled the times that she used to go down the docks with her Dad to see if he could get work, often to be turned away. It was the early building blocks of a very tough determined person. She was always a bit of a tomboy, preferring to climb lampposts and play with the boys than dolls. Vera then married and went on to have four children of her own. War came and Mum was now working at Burroughs in Cardiff. She also did voluntary work for the Church Army. War was over and mum met Dad at a dance in City Hall, Cardiff. Their first dance was “In the mood” by Glen Miller. Romance blossomed. Dad trained as a teacher and they married in 1949. Dad took a job at a school in Birmingham and within ten months, Hilary was born. Christine followed three years later. In 1955 Mum and Dad moved to Bracknell after Dad took a job at Wick Hill School, later to become Garth. Alan, David myself and Megan all appeared at two year intervals. By now we were at 54 Anneforde Place. It must have been tough; Mum didn’t work but stayed at home bringing up the family. She was fiercely proud and always managed to feed and clothe us. We loved her to bits. You could never pull the wool over her eyes and if we weren’t behaving, she gave us a look. We knew then that we were in trouble. This was even witnessed by Nik one of her grandsons when he stayed with Mum and Dad some years later. We had long summer holidays and mum and Dad discovered camping! Two adults and six children in one tent. A lasting memory is of Mum cooking a meal for 8 on a 2-ring camping Gas stove. Mum had a great sense of humour. She must have had - she read our school reports. Around 1966 Mum re entered the workplace as a part time playground assistant at Sandy Lane Infants. An abiding memory of life in Anneforde Place was the weekly visit of the Toni Bell Ice-cream man. Mum had learned that it was cheaper to to fill up a basin rather than buy several cones. Are you the man who does it in the basin? How much can you manage? The innuendo was lost on us at this age. In the early 1970s Mum took up the post of Lower School Secretary at Garth Hill. It was a husband and wife team - Dad in one office, Mum in the next and they both remained there until they retired in 1985. It is a testament to their marriage that living and working with each other 24/7 that in the entire time, they never appeared to have a cross word or major falling out. If they did it was behind closed doors. They loved each and everyone of their family. There appeared to be frequent visits to and from various aunts, uncles and cousins. 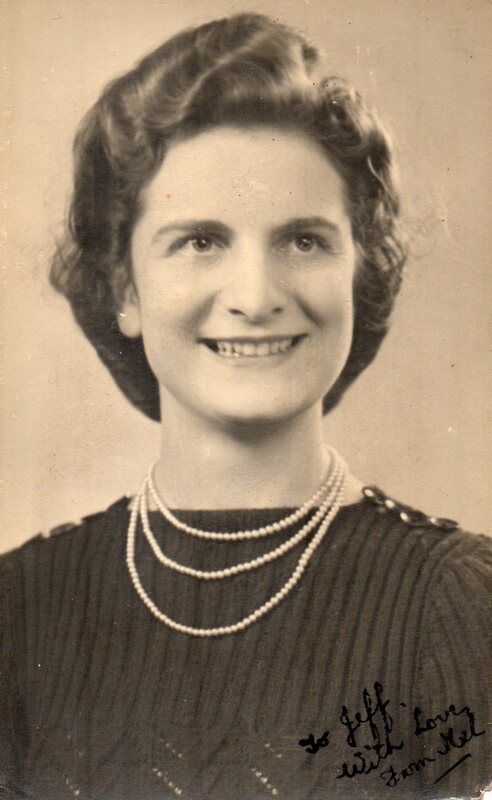 Sadly, Mum's sister Vera passed away in the early 80’s. Mum was deeply upset by this. Dig, Ol, Vera, Gil and Ken followed. This left Mum and Dad as the last of their generation. I keep mentioning Dad, but it is impossible to mention one without the other. They were a team. After retirement, they threw themselves into the Bracknell Active Retirement Association. They made many new friends went on numerous foreign trips and events. They loved retirement and all of a sudden they had a new-found lease of life. Family was everything to Mum, the subsequent arrival of ten grandchildren ( Sarah the eldest cant be with us today as she is in the States looking after her own family) Mary, Nik, Oliver, Felix, Tom, Emily, Jack, Matthew, Rachael and a step grandchild Rachael. You are all old enough to have known Granny when she had good health. Treasure those memories and do not let them fade. Several great grandchildren, Ben Dan, Lyra, Elsie, Magnus, Ezra, Luca, Edie and Mabel. A Fantastic legacy. Dad became ill and after a long illness died in 2006. Mum stayed in Anneforde Place. Now she was alone. Luckily Hilary and Christine were on hand but her health started to fail. Hilary had to visit the States for thee months in July 2009 for the impending birth of Dan and Ben. It was decided that Mum should go into a care home for three months while Hilary was away. So began the last chapter of Mum's life. She was now at Doveridge Care Home. She never returned to “54”. Over the next few years her health gradually faded. A few weeks ago her health notably declined and she gave up her fight a couple of weeks or so ago. Mum was not perfect, no one is, but she had tremendous qualities. Now, Mum and Dad are together again. We all have our memories of her, never let them go. To sum her up in a few words is difficult but I think Christine has done it better than anyone…. She never complained. She was stoic and strong and loved her husband, children and all her wider family. Hi Al. Always a sad time losing parents even though we are all programmed to expect it. You have wrote about yours which shows how much you cared. They will always be with you. They were my brother Gwyn's words. A nice homage, Alan; and beautifully judged, which isn't an easy thing to do, particularly when it's for close family. I can't seem to find a way to comment on your latest post on your old blog. But I've been trying to do the same as you. I can't see that any YouTube copy-write owner would go after a not-for-profit blogger, would they? Having said that, I can't find a way to extract just the music and add it to the slide show. But then again, I'm a techi-illiterate. I use the iMovie software that comes as part of the Mac OS X operating system to generate a Quicktime video. The music track is just added as part of the video editing process - same as with the video footage or Jpegs. I would think there are equivalent pieces of free software for Windows computers. All I have to do is choose and locate the music track (MP3, AAC or similar) in its folder and then either copy and paste, or drag and drop it, into the iMovie window on screen; it then becomes just another element in the video or slideshow and can be edited (volume adjustment, fade-in, fade-out, whatever...). So it's just another component at the point where the video is either saved, or exported once its completed. Although it deals specifically with using iMovie to create the video, some of the information on settings should be useful and could apply to other software. I took notes at every stage and now have a Word document which I can open and just crib the suggested settings. Using this method creates a .mov file - although I think there are other ways of doing that - and I've found the quality, after upload to Youtube, to be okay (I wouldn't put it any higher than that). I tried directly uploading MP4 files from iMovie and the quality wasn't as good. Hope this helps. I'll have another bash when I get a moment. I have to say I was delighted when I noticed your blog was active again. A very nice piece and tribute. See you in May. Thank you for your comment, Andy. When I first read this I was welling up and couldn't find the right words for a reply. A week on and I'm welling up again and I still can't find the words. To say that it's a fine tribute doesn't do it justice. Good luck, my friend on your fight, and I'll raise a glass to a full recovery! I couldn't find the words, and I still can't, your brother has a lovely way with words. A beautifully written piece, thank you for sharing. Only just seen this Al. It's a funny thing. Whilst this was very personal, much of the biographical details parallel my parents' lives and no doubt tens of thousands of others. For example I too had a grandfsther who had to turn up at work daily (he was a coalminer) in the depression, queue with the other men, and wait to see who would be picked to get a day's work. And the cheap family holidays we had in tents or, in one instance I recall, a hut in the sand dunes at Silloth, with mum cooking for us all on a rudimentary single ring. And so on. Expectations are so different these days. A lovely post thank you. I'm sorry to hear about your mother's passing. The eulogy your brother wrote is a moving tribute to her life, which sounds like it was full and wonderful. Thank you for sharing. Are you coming on the Challenge this year?